Interview with Mr Abbas Ghorbanalibeik, Vice President for Planning and International Affairs of the Islamic Republic of Iran Railway. Events- The importance given in most countries to rail transportation does not seem to prevail among Iranians. Why is that so? Abbas Ghorbanalibeik- There are certain reasons for this. Lack of attention to the railway is something that we have inherited from our forefathers. Our railway system has only existed since 70 years ago whereas in many countries the railway is at least 100 years older, i.e. over 170 years old. This era coincides exactly with the era of the motor vehicle and road transportation. The WWII also had a serious effect on the railway development in Iran. Although the main Iranian railway route from Bandar Imam port (Bandar Shapoor) to the Turkoman port helped the Allies immensely in the carriage of goods to the Russians who were fighting the Germans on their Eastern Front, a great deal of goods had to be transported by road from the south of Iran to various other parts of the country, to feed and supply the Allied forces dispersed in the country and to carry goods to the Russian borders in the north as well. Therefore, our railway was unable to develop rapidly. Another factor that played a significant role in slowing down the rate of growth of our railway system, during the last 30 years in particular, is the low cost of fuel. Gasoline or petrol costs 10 cents per liter here while it costs 70 cents in Europe. Such huge differences in price levels are borne by the Iranian state as subsidies. But recent studies indicate that subsidies on petrol benefit mainly the wealthier strata of the society, since wealthier families do not use public transportation and each may possess two or three, even four cars. The matter is now being considered by the government and in the Parliament. A high price of gasoline will force the wealthier people to use public means of transportation often and to look after their own vehicles properly so that these vehicles do not use excessive fuel thus cause pollution, and this would be of benefit to the whole society. Every year about 24,000 Iranians are killed in road accidents, with an increasing rate of 15%. This is one of the highest levels worldwide. One reason may be the unnecessarily high use of vehicles. The other point I should bring up here is the fact that the railways in most countries make losses in the passenger operations while making profits in the cargo operations. In this country the state demands from us that we should look after the passengers and provide them with the best possible services even at heavy losses that we have to bear. Whether we like it or not, our interest in the carriage of passengers diminishes because nobody likes to lose money. Now if we were given subsidies for passengers or were allowed to raise the costs of travels, we would be better inclined to develop the passenger railway network but as it is, there is not much serious interest. E- Are the railway stations and the rails and the other means and facilities of our railway in good condition at present? AG- Presently we have about 7,300 km of main railways, and the secondary, that is lines at the stations for servicing and parking the wagons and lines that load from the stations to major industrial or mining units etc, add up to 700 km. 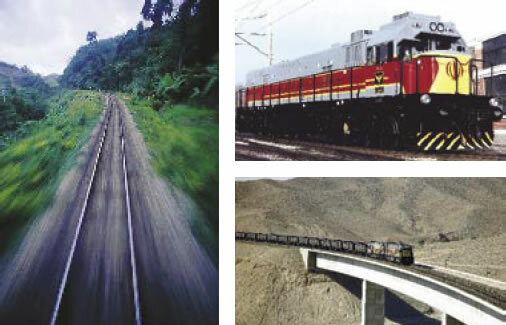 Of the 7,300 km of main lines 1,114 km consist of double track covering, i.e. Tehran to Qom and Tehran to Mashhad. We have also 148 km of electrified lines. Furthermore, the quality of our lines is quite high. Almost 50% of our lines consist of 60 kg/m rails with almost seamless welding. Because our passenger operation is very small compared to cargo operations our double-track lines are limited. Of course it is the ratio of passenger to cargo lines that is important in our country, as in other countries of the world. Our network connects five main ports, namely Bandar Abbas, Bandar Imam and Bandar Khorramshahr in the south, Bandar Amirabad and Bandar Gaz in the north to the main network. Our network will soon be connected to Bandar Anzali on the Caspian as well. These ports are connected to a network that covers all the major economic parts of the country and every highly populated city. Out of the 7,300 km of railways, 3,000 km have been built after the Revolution. I must say that after the Revolution a lot more attention has been paid to the railway in our economy. We have been adding 500 km of lines every year to our network, and hope to increase this yearly amount to 1,000 km, soon. E- It is often said that the railway, like most other activities that are presently owned or controlled by the state, will be soon privatized, or liberalized as economists would say. Can you give our readers the facts in this regard? AG- The Third Socio-Economic and Cultural Development Plan made it mandatory for some organizations and companies that were owned or controlled by the state to be handed over to the private sector in order to reduce the size of the government. I should point out here that previously our Railway was an organization that received its budget from the government and paid its earnings to the Treasury. 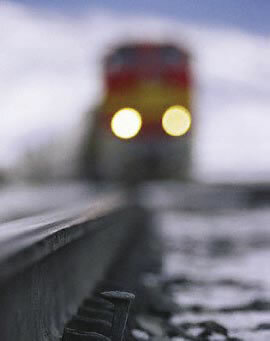 But since 1992, the Railway has changed into a company that has to stand on its own feet for the current expenditures. We are only given state aid to build new lines. Even so, the Third Plan found it necessary that the Company should become gradually liberalized. And during the past two years we have made excellent headway in this direction. 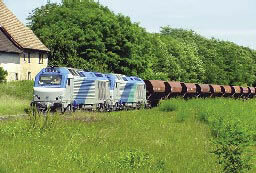 In the cargo section, the private sector will run 1,000 wagons by the end of the current year (20th March 2005). Presently we already have 80 private cargo wagons running. In the passenger section as well there are already 500 wagons running that are owned, run and maintained by the private sector. Eventually we should reach a stage where the infrastructure belongs to us but all the wagons and locomotives belong to, and are run and maintained by, the private sector. The private companies will have to pay us something for maintaining the infrastructure but the state forces us to set the level at the highest that the private owners can afford and accept, and no more. We may still need some aid from the state, especially to further develop the railway lines and network. E- Do you have any plans for journeys abroad? AG- If you mean passenger trains we already have lines to Istanbul and Damascus from Tehran, and to Nakhichevan from Azerbaijan Province and we plans to put up lines to Iraq, and also to Almati in Turkmenistan. To go to Europe from Tehran you must go through Istanbul. But right now we are planning to make arrangements that will enable the passenger to buy the ticket for the ultimate destination in Europe, right here in Iran. We have no trains to Afghanistan yet but it is one of our greatest priorities. We also have a line from Zahedan in our Baluchistan to Quetta in Pakistan but this line is not connected to our main network. Again we intend soon to have a line from Kerman to Bam and Zahedan which will connect the network to a point inside Pakistan. E- Most economists are convinced that soon the Far East will be a region of tremendous trade and economic importance. Don't you think having railway lines running to that region would be of great benefit to us? AG- The lines I have just been talking about are for passenger transportation. The cargo operation is quite a different matter. The ports we have on the Persian Gulf are points that can connect many landlocked parts of the world to international waters. Right now China can be linked to Iran on the one hand and to Europe on the other through Kazakhstan. But because the railway of Kazakhstan is built according to the Russian standards or gauge, i.e. a width of 1,524 mm between the rails and not the normal gauge used everywhere else (1,435 mm), the bogies have to be changed at the frontiers. So, presently Kazakhstan plans to build new lines that can connect China to Iran and Europe without the need for any change at the frontier. So goods from the Far East could come to Iran to be shipped to the rest of the world through the Persian Gulf. We already have train connections to Central Asia through Turkmenistan but again with the necessity of changing bogies. Presently rail travel from China to Europe takes 11 days. This little adjustment could reduce the period down to about seven days, according to expert estimates. E- Is the Railway of the Islamic Republic interested in foreign investments and if so what are its suggestions to potential foreign investors? AG- What I explained with respect to domestic private investment, more or less applies to foreign investment as well. Already we have received offers with respect to an express Tehran-Isfahan railway. Spain, Germany and Japan have made proposals in other areas. But so far our rates for passenger transportation have been found too low to justify such investments, because of the low returns. Recently, however, air travel costs have increased considerably justifying a rise in the costs of rail travels which are, by the way, the safest, cheapest and relatively fastest method of transportation. In the cargo operation sector we have had negotiations with the Russian Railway Consortium and, the Republic of Azerbaijan Railway. The Russians express serious interest in linking northwestern Europe to the Persian Gulf Region, and the Middle East in general, through our southern ports, and have made some proposals with respect to passenger transportation. So, as you see we have received interesting offers from abroad and would welcome more proposals.